Yuen Woo-ping works the same magic for Sammo Hung that he did for Jackie Chan two years previously with Snake in the Eagle’s Shadow and Drunken Master, by creating a specifically designed showcase for his leading man’s talents. The role of Butcher Lam Sai-wing – burly pupil of legendary sifu Wong Fei-hung – is a part he was born to play. 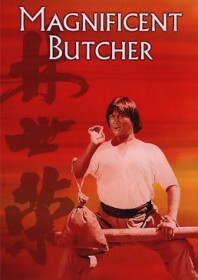 The Butcher is unashamedly loyal, boisterous and trouble prone, not to mention a supreme martial arts talent. Sammo steers this classic headfirst into the kung fu movie hall of fame. An extra layer of authenticity is added with character actor Kwan Tak-hing reviving his synonymous portrayal of Wong Fei-hung. A rather desperate story is the only minor quibble. Pupils at Fei-hung’s Po Chi Lam clash with the rival Five Dragon sect and their glowing hand master Lee Hoi-san, culminating in Lee’s horny son Fung Hark-on kidnapping the wife of Butcher Wing’s brother. But the fight scenes are strung together well. The standout showdowns involve classy fan-fu between Lam Ching-ying and Yuen Biao, and crazy cat Chung Fat giving Sammo a decent run for his money. The obligatory training scenes are also conducted with great aplomb, with Fan Mei-sheng adopting an alcoholic beggar role as the Butcher’s other master in a part originally devised for Woo-ping’s father, Simon Yuen Siu-tien, who died during production.